I am ashamed to admit it, but I must confess: I’m an exclaimer. I’m not talking about verbal exclamations, although my wife and kids do say I can cut the volume a bit during my moments of high tension. I’m talking about over-using exclamation marks in my digital communications. Seinfeld fans may remember an episode where Elaine gets into an argument with a short-lived writer boyfriend over his unwillingness to use exclamation marks. “I would put exclamation points at the end of all these sentences!” she yells at him. “On this one! And on that one!” The argument spills over into Elaine’s work as an editor when she is called on the carpet by her boss for over-inserting exclamations in the boyfriend’s manuscript. “It was damp and chilly afternoon, so I decided to put on my sweatshirt!” And chaos and laughter ensue. 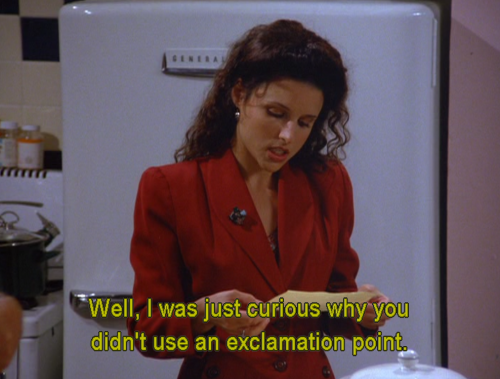 Seinfeld is all about exclamation points, even more than it’s about nothing. But real life doesn’t need to be as exciting all the time. If everything gets an exclamation mark, everything is amped up, and like the boy (small person?!) who cries wolf, we won’t know when we really need to get excited. This is no cause for alarm! A quick spot-check reveals no instances of “Thank you for sending the budget template!” or “It’s time to review the budget!” or “I can’t seem to find the budget!” None of these are emergencies, in my humble opinion. But now that the exclamatory genie is out of the punctuated bottle, I’m made to feel (note the passive voice!) like I’m letting down the people in my work orbit if I just say, “Thanks.” Am I just not conveying the same level of enthusiasm that they are? (Or more likely, are they just better at faking enthusiasm than I am?) Ah, the sad, lonely, quiet life of an ordinary period. It’s just there, but nobody sings its praises. They just say them, not too loudly, not too softly. It makes me wonder why there is no negative exclamation point—a punctuation mark that tells you to quiet it down a bit instead of screaming to the world. (Or is quietness conveyed by parentheses, like these.) Maybe we should create a new symbol that ends quiet sentences, like an index finger over closed lips.